Support young Independent artist collective. We are 3 young artists from India, Iran and Germany, trained in Indian classical dance and music. Since the past one year, we’ve been working on an independent project called Kalatva Collective. 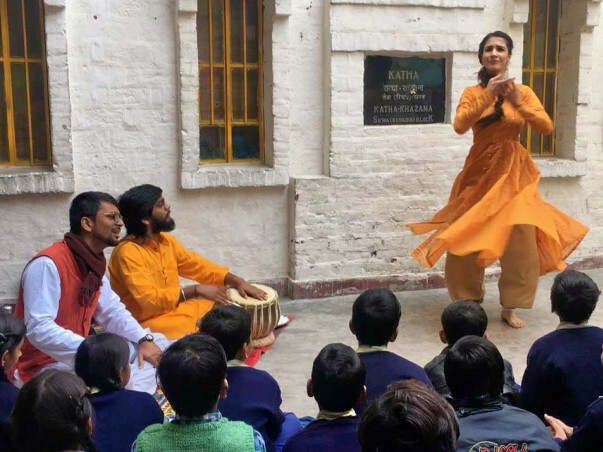 Our two primary objectives are; breaking the conventions of Indian classical music & dance, and bringing art to underprivileged kids. We’ve performed classical sets in India and abroad and worked with kids from the underprivileged background but we wish to stretch our horizons now. 3. Visiting refugee camps of the very same towns to perform for them. We have been giving music and dance workshops to the underprivileged kids in India from past one year. As true artists dedicated to our art and society, we feel it is our duty to take up new challenges and ensure our art reaches other geographies. Therefore, we wish to propagate and introduce the language of art to the underprivileged kids in abroad who are trapped in the clutches of unfortunate and hapless actions of mankind. Art will provide them with a medium to communicate and translate their sorrows and stories as refugees. Their only shred of hope is this grief-stricken world is to see the good in humanity and their yearning to see next day’s sunrise. As artists, it is our duty to share their pain, if not help them overcome it. And so, we will spend 10 days with them, teaching them Music and Dance in a hope to divert their minds from the cruelty of this world and to provide them with a creative tool to fight every day. Our dance and music workshop for refugee girls aims to give them a unique and individual body language to deal with their experience of migration and share it with an audience. 2. Performance of the participants in public spaces. They will perform a narrative choreography in which they tell their story of migration. The story of migrants walking the distance from their homelands to Germany on dangerous roads, the story of those who never reach their destination should be told and heard. They are the unsung heroes of the society and they deserve a pedestal to voice their own narrative. Last year we did a 10 days workshop with the refugee kids in Germany and this time we wish to stretch the canvas and include more subjects to weave a story which will reverberate through walls into the ears of the people responsible for slaughtering the prospects of a kid’s happy childhood. And for that, we count on you to make it happen. Any amount you donate would be a step closer towards a kid sharing his story via art and not through tears. Every token from your end will make someone’s day. The refugee girls from different camps were contacted. About 10 participants (5 from last years workshop) registered for the workshop. The dates are fixed. The workshop is going to happen from 15-21 July, on 21 july 6 pm the final performance will happen in KAZ / Jungess Theater, Hospitalstraße Göttingen. The charges for that night will be 20 euros. Currently we are looking for studios / rehearsal rooms / etc. in the town. Different institutions were contacted. The charges for the that will probably come around 100 euros. We still need to pay for the participants transport costs from the donations which we recieved as well as for dance material (such as ghungroos, costumes, make up, jewellery etc.). Also posters and pamphlets have to be printed to advertise the performance. Alles Gute für Euch! Hope to see you in summer in Germany!